Summer is just around the corner and I have started planting...yes you heard that right. Now it's nothing big, just a few herbs, beans and some radish (for hubby, I don't eat radish). I have a few more things to plant, but there is a crap-ton of work yet to be done to prepare a place - maybe a raised bed or some large containers. I don't know what yet, but the weather is right for growing now that the temps are warm and the monsoons seem to have subsided, at least for the time being. To date, the thyme and oregano have sprouted, and the basil got overturned, probably by a squirrel or other critter. I had to replant it. I also have a large container that is probably 7 feet by 2.5 feet and maybe a foot deep that was originally used to house bait. My mom got it years ago when the man who sold bait closed up shop. It has been used for plants ever since, and I have it now. I grew beans in it last year and they did pretty good considering I failed to notice that I had bought climbing bean seeds. The stakes I put up were not sufficient and some ended up in the neighboring azalea. Nevertheless, we got several batches and they bloomed right through October. We shall see what happens this year. I planted all bush beans! All gardeners are welcome to chime in with stories and/or advice. Since I opened my store, Rosie B. Designs, last last year, I have been steadily increasing my virtual inventory and now have about 300 items for sale. My products/designs include men's and women's apparel, home decor, things for the kitchen and bath, beach towels and totes, notebooks and planners, phone cases and much more. With Zazzle, my only investment is my time and the thought that goes into my designs. That said, it is always gratifying when someone chooses one of my products over the thousands of others in the online marketplace. There is really something for everyone, and since it's a online store it is open 24/7. Clicking the link at the beginning of this post will take you directly to my store. You can also follow me on Social Media at Facebook.com/RosieBDesigns97 and on Twitter @RosieBDesigns97. If you have any questions, you may contact me through Facebook or Twitter. As always, thanks for shopping at Rosie B. Designs! This is the day 8 (&9) of the 2019 edition of the 20 Days of Chill writing challenge hosted by P. J. at A ‘lil HooHaa. Please join us this month on our writing journey. Today I am combining Monday (Planning) and Tuesday's (Spring vacation) prompts as I am playing catch-up again. Since both these prompts relate to one another it will be easy to combine them. They go together like a hand in a glove, like dinner and a movie, like Hansel and Gretel, well you get the idea. It is very difficult, for me at least, to take any vacation, no matter how long or short or how far away, without considerable planning. Why not just stuff some things in a bag and go, you ask? Oh, my friend, you do not have pets to get a sitter for, and you do want to use that credit card, right? What's your available credit and do you need to make a payment? You don't want to hear "I'm sorry, your card has been declined" when you have just finished a $50 dinner. Oops! And then there are your accommodations. If you're staying in a hotel, many things are provided and you'll probably be eating out. But, if you choose a condo, you may need towels, sheets, toilet paper, paper towels, soap, and don't forget your hair dryer. Not worry, though, there is a Walmart just around the corner...you hope. Once you know where you're going, and booked your hotel/condo, it's helpful to know what you'll be doing and what type of weather to expect. If you're like me, you have gotten to your destination and wish you had a warmer coat, an umbrella or some shorts instead of all jeans. See what I mean? Planning goes a long way to making your spring vacation more pleasant, and you know that Fluffy or Fido are also being taken care of. So are you the free spirit yelling "ROAD TRIP!!!" or are you the planner? This is the day 7 of the 2019 edition of the 20 Days of Chill writing challenge hosted by P. J. at A ‘lil HooHaa. Please join us this month on our writing journey. Today's prompt is Games and Hobbies. Games. I played them as a kid with my parents. We would play Uno and Yahtzee and sometimes Rummy. As adults, we went through a phase of playing Scrabble. Now, in the age of smart phones, we play a variation of Scrabble called Word Feud. It is similar to Words with Friends and other online word games. It is something we have been doing for over 7 years, every day. Hubby and I play each other and two other friends. It never gets old because each game is different. Like in Scrabble, sometimes you get great letters and sometimes you get crappy ones. You can swap or pass, if you can't play or don't want to play what you have. We often remark on what a wicked sense of humor Word Feud has because you may swap some or all of your letters, hoping to get something better, and find you are no better off than before, and you lost a turn. There are two different board styles, the standard board which closely resembles Scrabble and a random board that has way more opportunities to score big, win big...or lose big. We play the random board with each other and the standard board with everyone else. The benefit of playing on the phone (or other mobile device) is that you can stop and start and play when you have a few minutes and not have the pressure of finishing a game. As I sit typing this post, I just got a notification that "someone played". Do you play games on your phone? Solo or with others? This is the day 6 of the 2019 edition of the 20 Days of Chill writing challenge hosted by P. J. at A ‘lil HooHaa. Please join us this month on our writing journey. Today's prompt is A hot drink on a cold winter night. I am not much for hot beverages. I prefer cold, iced drinks or at least a well chilled white wine. 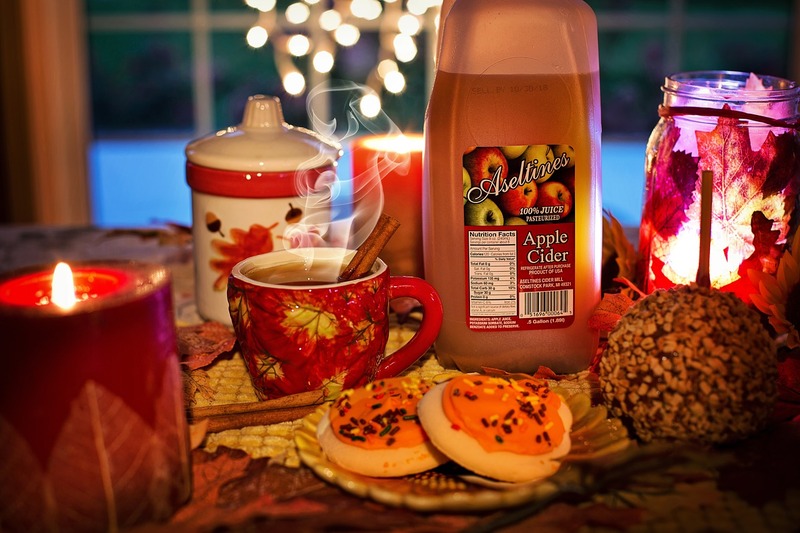 But, on the rare occasion that I choose a hot beverage, I like a good, hot apple cider. We like to visit the beach in the late fall and the restaurant next to our favorite hotel usually has a big pot of cider there for the taking. It is delicious and comforting as it is often quite chilly at night, and it's nice to take a steaming cup back to our room. Other than that, it is an occasional cup of tea at night, but again usually in the winter.